The amazing iPad comes with some standard apps and lots of new features. Once you open up a brand new iPad you will already have a number of pre-installed apps to play with. However, the real fun with your iPad starts when you download and install new apps in it. There are millions of exciting options in the App store which will keep you entertained all year round. These apps have different classifications such as Media, Games, Productivity, Sports, Utility, Music & Video and so on. In this article, we will be telling you about some of those apps which have been very popular. In the media category, we have a number of amazing apps such as News360, Boxfish Live Guide, Comics and so on. These are really engaging apps and they are available for free. News360 is a great app for news that makes it easy to get all the current news of your interest from one feed. Boxfish Live Guide is considered a perfect TV companion. This app can allow you to search for TV content in real-time and it also doubles up as a remote to switch you directly to the program you are interested in. Then we have Comics app from the Media category that gives you access to your favorite comics from Batman to The Avengers. With this app you will be able to enjoy classic comics on the bright and vibrant retina display of your iPad. In the music and video category, we also have a number of noteworthy apps. For example, if you like to watch a lot of videos on YouTube, you can use the Jasmine app which is free of cost. With its simple and tidy interface, you can play music videos or listen to music in the background while you are using other features of your iPad. This little app allows you to customize as well. Then there is Discovr Music, an interactive map of the music world that helps you to find out more about the music and musicians of your interest. Under the Utility section, we also have some amazing apps such as Camera+, a camera app with adjustment tools for photos and stylish effects. There is another app named Paper which is a simple, uncomplicated app that changes your iPad into a sketch pad. 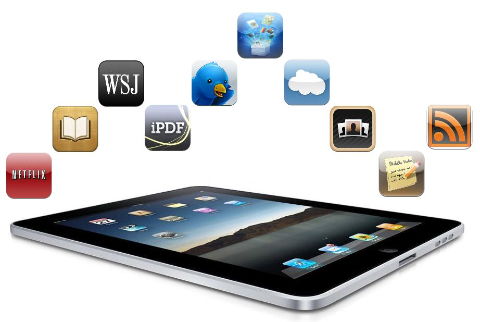 Do you have questions about your iPad and how to best use this great tablet in your business? Â Our team are the best in ensuring your business has the right advice for all your mobile computing needs.